When my children received the video of Cinderella as a summer gift, they watched it almost nonstop for three days. Since it was warm outside, we kept the windows open. 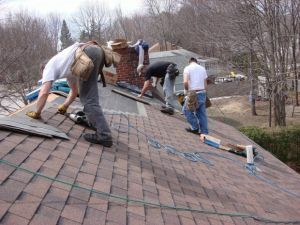 Our neighbors were having their roof reshingled by three burly men. As I went out to get the mail one afternoon, I heard a roofer singing, "...put it together and what do you get?" "From the other side of the house came a chorus of two more husky voices: "Bibbidi bobbidi, bibbidi bobbidi, bibbidi, bobbidi boo!"